The Isaiah Project organizes broad-based, encouraging showings of support for expanded public transportation during public comment period at Board of Supervisors meetings in Henrico and Chesterfield Counties. We go out four times a year, twice to Henrico and twice to Chesterfield. These outings are called "Isaiah Project Speaks." While communities of faith in each locality lead the way, we invite broad regional solidarity and participation. On October 24th, we will be going to the Chesterfield Board of Supervisors. We are hoping to have at least 40 people of faith who live in Chesterfield leading the way this fall. If you can join, please RSVP here. Your participation makes all the difference! For more details, please contact isaiahproject@richmondhillva.org or see rvarapidtransit.org/isaiah. Note: We also have an Isaiah Project Speaks in Henrico coming up on Tuesday, September 25th. Click here for more info! This screening of Free to Ride hopes to inspire and encourage congregations and faith groups to begin the work of connecting folks to the basics of life through public transportation. From our friends at Sports Backers comes the Pulse Pedal Pursuit, an all-day celebration of all things RVA, and our new public transit options! Henrico Board of Supervisors Meeting, March 13! 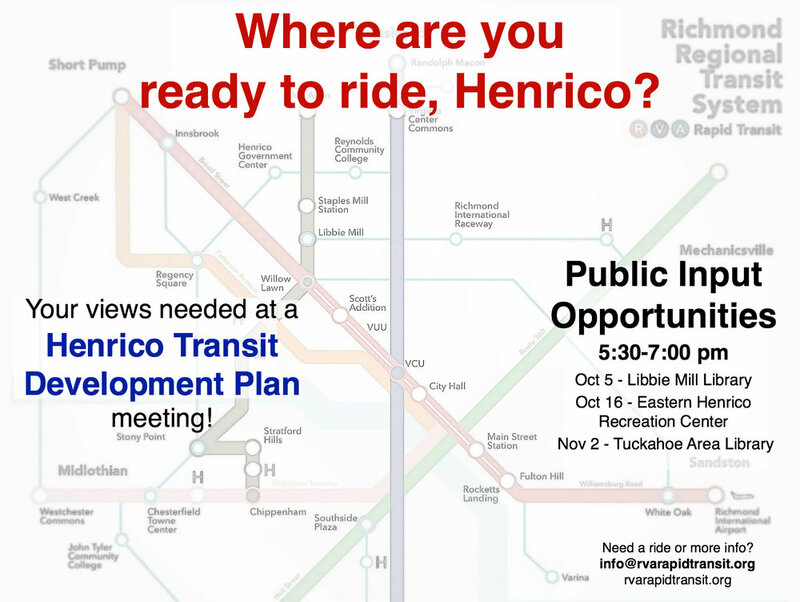 Come show encouragement and support for expanding public transit in Henrico and the benefits it would bring! As Henrico County considers budgeting for more public transit service, we’re seeking to offer invigorating support and encouragement at the March 13th Board of Supervisors meeting. RVA Rapid Transit's Henrico Team will have a few speakers during the Public Comment Period. All you have to do is show up, look encouraging, and rise together when one of our speakers invites supporters to stand. Want to learn more about the promise and need for regional public transportation? Ready to be able to catch a ride out to Short Pump? The airport? Midlothian? Ashland? Chester? We would love to come present to your organization, civic association, congregation, business, or group of interested Richmonders. Contact us at info@rvarapidtransit.org to schedule a presentation. We will come give updates on the movement for metro-wide transit and how you can get involved. Step #1 though, join our weekly email list here! If you cannot make a meeting, and you live, work, shop, or play in Henrico, please fill out the online survey and share with Henrico friends! Note: If you need transportation to a meeting or more information, please contact info@rvarapidtransit.org. And if you would like help organizing members of your congregation or others to join in these crucial meetings, just contact us too! See also the announcement from GRTC here and from Henrico County here. See also the Henrico County Transit Choices Report - August 2017. Due to the number of transit related events in October, this screening is being moved to a winter time event. Please check back for more information on new date! Thank you! Richmond Hill, Hope in the Cities, and RVA Rapid Transit invite you to join in a faith-based viewing and discussion of the documentary “Free to Ride,” which examines the intersection of public transportation and civil rights in Dayton, Ohio. "Free to Ride" raises key issues about the important role public transportation plays in our communities so that all have access to what they need to thrive (see trailer here). For more info and RSVP, contact info@rvarapidtransit.org or see facebook event page here. Metro Richmond currently ranks in the bottom 10% of U.S. metro areas in terms of public transportation, despite the critical role transit plays in connecting people to jobs, job training, commerce, school, affordable housing, nutritious food, routine health care, worship, family, and friends. A broad-base of faith communities has been expressing the need and benefits of expanded public transit for our region. You can see Clergy Statement of Support here. Join us on TBA for this screening and discussion of "Free to Ride" to learn as well about key ways to get involved in the movement for metro-wide transit. Your voice is essential! "Raise up the foundations of many generations"
Richmond Transit: What's Happening and What's Next? A growing grassroots network across metro Richmond is organizing around the need and benefits of a regional public transportation system. Partnership for Smarter Growth and RVA Rapid Transit invite you to join in an informative and engaging evening about transit in our region. Experts from TransitCenter will be in town to discuss where Richmond fits in national trends regarding bus networks and BRT, transit-oriented land use and streetscaping, as well as cities and transit agencies working together. 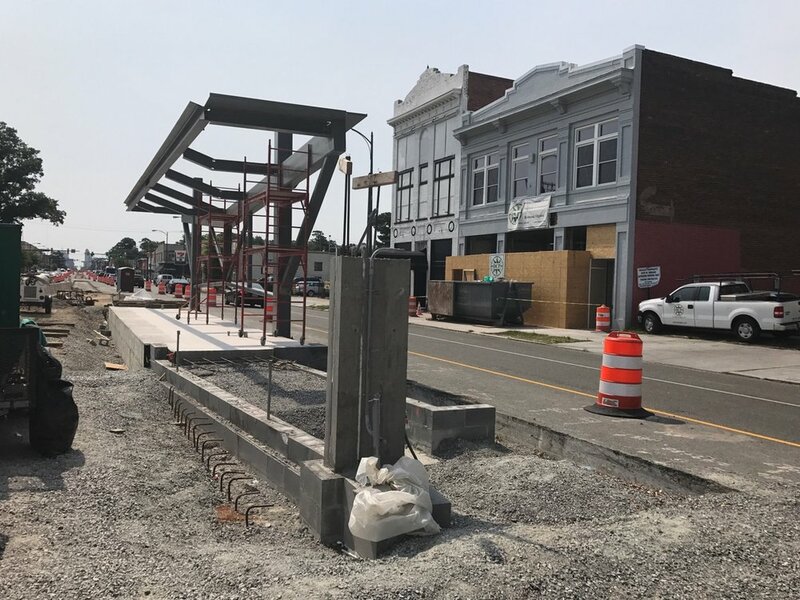 We will also have updates from GRTC on developments happening right now in our public transit system, and an overview from RVA Rapid Transit on critical opportunities this fall to encourage greater connection across the region. Admission is free, but please RSVP below. Light food and refreshments will be served before and following the event. Please spread the word! Chesterfield County has released the draft of the Northern Jefferson Davis Special Area Plan (PDF). This plans covers the Jeff Davis corridor in Chesterfield from the Richmond City limit south to around Route 288. There is a very important opportunity for public feedback next Wednesday, May 10th, to express the call for local bus service, every day of the week, from the City limits to John Tyler. So! If you are a Chesterfield resident, put May 10th on your calendars. They're hosting the meeting from 3:00 PM–7:00 PM at the Bensley Community Building (2900 Drewy's Bluff Road). You don't need to stay the entire time, just drop in whenever and let them know what you think. If you can't make the meeting, you can email your citizen comment to: bowlingj@chesterfield.gov. Also see the following link for more info: www.chesterfield.gov/jeffdavis/. GRTC is holding 14 identical meetings throughout the month of March to introduce the changes being made via the RTNP. Find the meeting for you here! Richmond Regional Planning District Commission welcomes your attendance! Speak directly with the region's main platform for inter-jurisdictional cooperation. Publicly comment on the need for regional transit! Publicly comment on supporting the Richmond Transit Network Plan's alignment with the Pulse line! Council will be voting upon Ordinance 2017-022, which will authorize the City to receive extra funding from the Virginia Department of Transportation, "for the purpose of providing funding for technical work, marketing, planning, project management, and public outreach initiatives related to the implementation of the Richmond Transit Network Plan project."